Gov. Charlie Baker and other members of the Beacon Hill brass took the ALS Ice Bucket Challenge Monday afternoon on the steps of the State House. 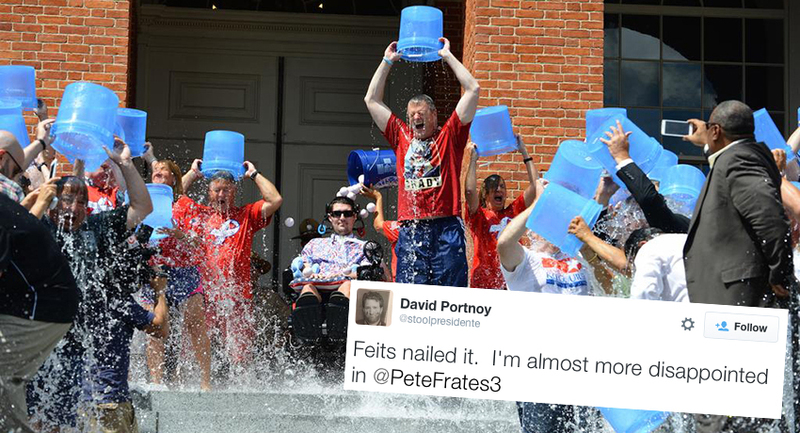 As part of the campaign’s second year, 150 people dumped ice water on themselves—joined by former Boston College baseball captain and poster boy Pete Frates—to raise money and awareness for ALS, a progressive nervous system disease. For the occasion, Baker wore a “Free Brady” T-shirt in a display of silent solidarity with New England Patriots quarterback Tom Brady, whose four-game suspension for his alleged role in Deflategate was upheld by NFL Commissioner Roger Goodell last month. Though many were amused, the folks at Barstool Sports—who sell the original “Free Brady” shirt, different from Baker’s—were disappointed with the governor’s choice of wardrobe for the charity event benefiting those afflicted by the debilitating disease, which attacks nerve cells in the spinal cord and brain. Hey @PeteFrates3 I hold you told @CharlieBakerMA that he's a fraud for wearing knockoff #freebrady shirt my brain invented. Each winter since 2013, Barstool holds a “Plunge for Pete Frates” event, raising thousands for Strike-Out ALS, including the donation of all proceeds from the sale of a special “Frate Train” shirt. However, Frates—who has lost the abilities to walk, speak, and swallow to the disease—was not immune to criticism either. Monday night, Baker pleaded ignorance and apologized for wearing the wrong “Free Brady” shirt while raising awareness for a disease that destroys motor neurons in the brain, resulting in gradual, sometimes total paralysis, and death.